Each $39 box contains 24 packs. Each pack contains 6 cards. 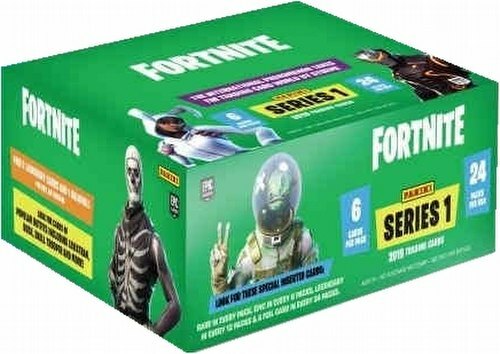 The international phenomenon takes the trading card world by storm in the 2019 Panini Fortnite Series 1 Trading Cards set. Collect 300 cards ranging from gameplay screenshots, weapons, harvesting tools, and outfits, including fan-favorite outfits such as Leviathan, Skull Trooper, Dusk and more! Find Holofoil parallels of Uncommon, Rare, Epic and Legendary cards which mimic in-game rarity! On average, each box will include the following hits - 4 Epics, 2 Legendaries, and 1 Holofoil Parallel.